Why pay roaming rates in Canada when you can get a plan that covers you for everything you need? The National Geographic SIM Card for Canada offers a 30 day plan with a US number, 10GB of 4G speed data and unlimited calls and texts to Canada and back to the US! We will activate the card for you on the date your specify and email your new US number at that time. We generate your US number based off of your Zip code and can give you your home area code! Additional data or additional 30 day plans can be requested by contacting us by phone or email. Your SIM user guide will provide all the details. You must make sure your phone is unlocked and know the SIM card size it takes. Call us if you have any questions at 1 800 287 5072 (M-F 8am-4pm PST) or email support@cellularabroad.com. Going for less than 30 days? We can turn on your service early and you can use the unlimited calling and data while here in the US! Your National Geographic SIM card for Canada boasts 10GB of 4G speed data for use in Canada. 10GB is more than enough for most users and can be used for any internet function or app you currently use. The Canadians are friendly, but having access your own maps, Google searches for restaurant reviews and GPS is essential! Upon request you can add on another 30 days of the offered plan for $79.95. Will the SIM card work with my phone? As long as your phone has the international GSM bands (virtually all do) and is unlocked, it will work. 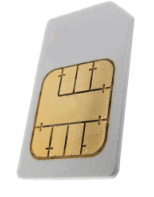 Be sure to select the correct SIM card size for your phone. How much does it cost to make a call or send a text when I'm in Canada? Your plan offers unlimited calls and texts to Canadian numbers or back to the US. When will I get my US number? Your US number is generated when your SIM is activated. The activation date is up to you. The instructions you receive with the SIM will ask you to email the date you want your plan to go live. You will be emailed your US number on this date. Will the service work in United States? Yes, and if you are going for less than 30 days we can turn on your plan early and you can use the unlimited calls and text and data while in the US! How good is the coverage in Canada? Coverage is exceptional. There are, of course, areas where there is limited coverage but as a rule of thumb, where there are people or roads (excluding isolated country roads), there is usually coverage. The SIM operates on the Rogers network, the largest provider in Canada. How much will it cost people in the USA/Canada to call me on my number while in Canada? The same price is costs them to call any US number. Yes you can. You can simply forward your current number to your new US number we provide. Please ask your current carrier how to do this.